Information for this article was obtained from The Lincoln Editor provided to us by Judy Cremer and from newspaper clippings compiled by Mrs. Dorothy Folkers. John W. January was a civil war veteran who lived in Minonk in the late 1800's. He became famous for surviving as a prisoner of war in such a deplorable condition. January was born in Clinton County, Ohio in 1845. He emigrated to Illinois in 1852 and settled in Minonk in 1861 and became a farmer. He lived with his wife and five children in the house now occupied by Mr. and Mrs. Howard Builta one mile south of Minonk. During the Civil War he was mustered into Company E of the 14th Illinois Cavalry on March 28, 1864 in LaSalle County. "The 14th Illinois joined General William T. Sherman's troops in Georgia as part of General George Stoneman's cavalry. They participated in Stoneman's raid on Macon, Georgia, the purpose of which was to cut a railroad line and then free Union prisoners of war being held by the Confederates at Macon and Andersonville. Confederate cavalry under Joseph Wheeler overpowered the raiders at the Battle of Hillsboro or Sunshine Creek on July 31, 1864, and captured many Union troopers, including January." He and 1800 other prisoners were sent to prison at Andersonville, Georgia, and then Florence, South Carolina. John W. January after his release from Andersonville Prison. "During his imprisonment, malnutrition, scurvy, and gangrene damaged his feet to such an extent that he amputated them himself with a penknife because none of the army doctors would perform the operation. January survived and arrived in David's Island in New York on February 28, 1865 weighing forty-five pounds. He spent seven months under treatment in a hospital and recovered well." An interview with Valentine Meyers in The Pantagraph in 1906 gave a slightly different version of January's ordeal. Meyers was an army nurse and helped take care of January during his recovery in the hospital in Florence, South Carolina. Meyers said that when January was first brought to the hospital in November of 1864 he was sent to lie in the pen because the hospital was full. Meyers said that January's clothes were stolen from him while he lay unconsious on January 5. Friends got together to provide him with some new clothing. Meyers claimed that when January asked to have his feet cut off, the army doctor refused and told him that he was going to die anyway and he wanted him to have his feet with him when he died. January managed to convince the doctors to remove his feet. Meyers said that it was an easy task because the gangrene had rotted his bones away. January returned to Minonk after his recovery and settled back on his farm one mile south of Minonk. He received a $100 a month pension because of his disability compared to the $75 a month for other veterans. 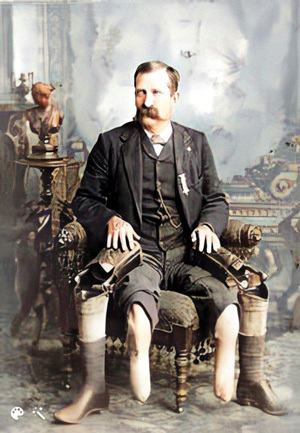 In an article in a Henry newspaper it was quoted that January needed to rest frequently because his feet would swell from the prosthestic legs that he wore. He regained his weight and eventually weighed over 200 pounds. January left Minonk in 1892 and moved to Del Rapids, South Dakota. He remained there until his death at 60 years of age on November 29, 1906. 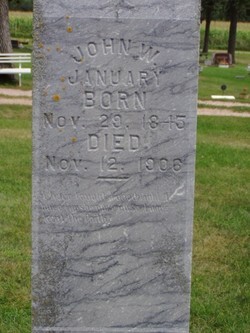 Tombstone for John January in Dell Rapids Cemetery in Dell Rapids, SD. Photo courtesy of Teri Fiegen.